1 Tbsp ketchup, bbq sauce, ranch dressing or other liquid to hold texture. 4 slices fat free cheese if desired. 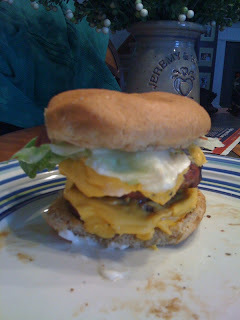 toppings could include: mustard, mayo, ketchup, lettuce, tomato, onions, turkey bacon pickles etc. Mix all ingredients in a bowl except buns and cheese. Shape into 4 patties and grill on the George Foreman grill for 5-6 minutes or until done. NOTE: Pic is of Jeremy's double decker! Soft Serve Banana "ice cream"
Eggplant & black bean "stew"